Georgia (Listeni/ˈdʒɔːrdʒə/; Georgian: საქართველო, tr. Sakartvelo, IPA: [sɑkʰɑrtʰvɛlɔ] ( listen)) is a country in the Caucasus region of Eurasia. Located at the crossroads of Western Asia and Eastern Europe, it is bounded to the west by the Black Sea, to the north by Russia, to the south by Turkey and Armenia, and to the southeast by Azerbaijan. 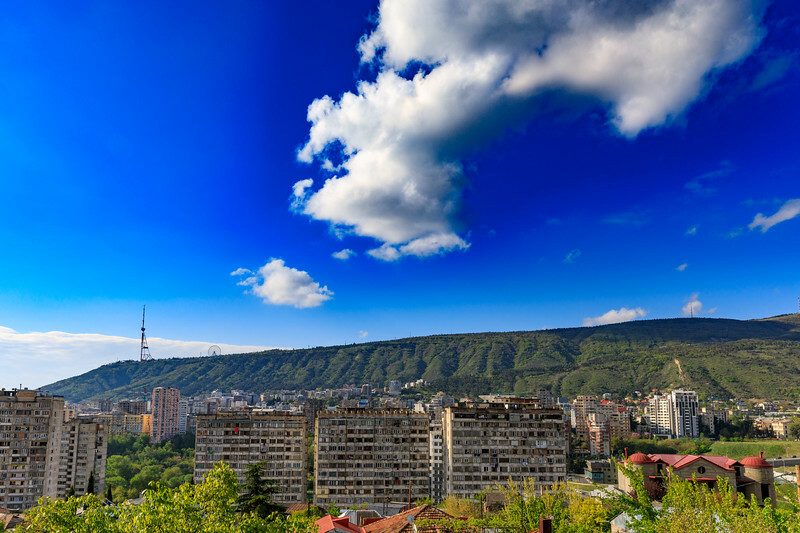 The capital and largest city is Tbilisi. Georgia covers a territory of 69,700 square kilometres (26,911 sq mi), and its 2016 population is about 3.72 million. Georgia is a unitary, semi-presidential republic, with the government elected through a representative democracy. During the classical era, several independent kingdoms became established in what is now Georgia, such as Colchis and Iberia. The Georgians adopted Christianity in the early 4th century. A unified Kingdom of Georgia reached the peak of its political and economic strength during the reign of King David IV and Queen Tamar in the 12th and early 13th centuries. Thereafter, the kingdom declined and eventually disintegrated under hegemony of various regional powers, including the Mongols, the Ottoman Empire, and successive dynasties of Iran. In the late 18th century, the eastern Georgian Kingdom of Kartli-Kakheti forged an alliance with the Russian Empire, which directly annexed the kingdom in 1801 and conquered the western Kingdom of Imereti in 1810. Russian rule over Georgia was eventually acknowledged in various peace treaties with Iran and the Ottomans and the remaining Georgian territories were absorbed by the Russian Empire in a piecemeal fashion in the course of the 19th century. Following the Russian Revolution in 1917, Georgia obtained its short-lived independence and established a republic led by the Social-Democrats in 1918, only to be invaded by Soviet Russia in 1921 and subsequently absorbed into the Soviet Union as the Georgian Soviet Socialist Republic. A pro-independence movement led to the secession from the Soviet Union in April 1991. For most of the following decade, post-communist Georgia suffered from a civil conflicts, secessionist wars in Abkhazia and South Ossetia, and economic crisis. Following the bloodless Rose Revolution in 2003, Georgia pursued a strongly pro-Western foreign policy, aiming at NATO and European integration, and introduced a series of democratic and economic reforms, which brought about mixed results, but strengthened state institutions. The country's Western orientation soon led to the worsening of relations with Russia, culminating in the brief Russo-Georgian War in August 2008. Georgia is a member of the United Nations, the Council of Europe, and the GUAM Organization for Democracy and Economic Development. It contains two de facto independent regions, Abkhazia and South Ossetia, which gained very limited international recognition after the 2008 Russo-Georgian War. Georgia and the overwhelming majority of the international community consider the regions to be part of Georgia's sovereign territory under Russian military occupation.